If you click the keyboard icon to “Discuss on Talk” one of your favorite subjects, you’ll find a page with a button “More Info on SIMBAD”. This button takes you to a powerful database, the “Set of Identifications, Measurements, and Bibliography for Astronomical Data” run by CDS, the Centre de données astronomiques de Strasbourg in France. But like many powerful tools, this one takes a bit of care to use, so I thought I’d offer some tips. The first thing you need to remember about SIMBAD is that–wonderful as it is–it’s far from perfect. Indeed, if SIMBAD contained everything we needed to know about every object in the sky, we wouldn’t need to do any more astronomical research! For example, as I’m writing this article, SIMBAD contains about 7.4 million objects. That’s a lot of sources. But for example, the WISE mission found about 747 million objects: 100 times as many as there are in SIMBAD. Looking at those numbers, you might get the impression that most of the time, when you click the “More Info on SIMBAD” button, you’d draw a blank. But it’s not that bad; we pre-selected objects for DiskDetective that are relatively bright, so the overlap with SIMBAD is pretty good. But it is pushing the limits. So if you see a list of objects on SIMBAD, and one is 100 arcseconds away, then that object probably doesn’t even appear entirely on the screen–though if it’s a bright object (and objects in SIMBAD often are) you might see some artifacts from it leaking into your field of view. Of course, the coordinates in SIMBAD aren’t perfectly accurate, either. It’s not uncommon to see errors of an arcsecond. So you can get a good general mental map of where things are from SIMBAD, but you can’t expect things to line up perfectly. OBut crucially, if the SIMBAD object is less than 10 arcseconds away, it’s likely in your red circle. SIMBAD contains other kinds of gotcha’s. For example you might see an object in SIMBAD labeled “2dFGRS TGS224Z188 — Galaxy” and you’ll figure that what you’re looking at has to be a galaxy. These classifications are right most of the time. But they are also far from perfect. For faint objects, the classifications might be based on astronomical images that are subject to substantial amounts of noise, for example. So what’s SIMBAD good for? Well, if your DiskDetective object is relatively bright, e.g. it looks like the image is saturated like the depicted here, or surrounded by its own diffraction spikes, then it will probably give you a reliable classification in one shot. 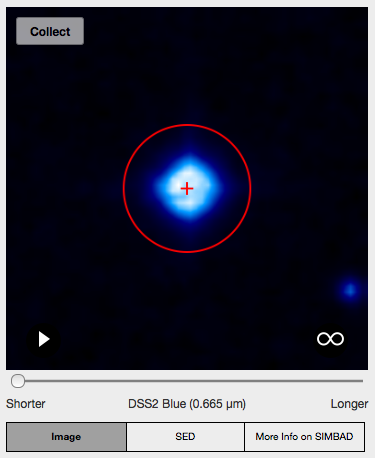 You can quickly find out if your object is a star–and crucially, find out if it’s a star with a known disk! Just look at the “References” on the SIMBAD page, and you can browse the literature on the object, and check for papers about Debris Disks or Herbig Ae stars or T Tauri stars for example. If you do find an object with a known disk, mention it on Talk! Because then we all get to do a little jump for joy, because it shows DiskDetective is working as it should. We included the SIMBAD links because while you’re doing your detective work, SIMBAD can give you some useful clues. It may even help you come up with your own research ideas. Just remember that ultimately, your goal as an astronomer is to improve and augment the data in SIMBAD, not to trust it blindly. if it’s possible i would like to see more examples, thanks!